Giraffe Manor is one of Nairobi’s most iconic buildings: characterful, picturesque, and enveloped in history like the foliage creeping over its brickwork. With its stately bush-hammered masonry façade and elegant interior, Giraffe Manor has an extraordinary appeal. Guests remark that it’s like walking into the film Out of Africa: indeed, one of its six suites is named after the author Karen Blixen. Giraffe Manor is merely 20 kilometres from Kenya’s bustling capital city, Nairobi. This city is a splendid mix of modernism as well as culture and wildlife. From 8-lane superhighways to a national park right at its outskirts, Nairobi City offers just what a modern African city entails. Travellers from all over the world now make the Giraffe Manor part of their East African Safari, especially repeat guests, who have become old friends. The manor has stunning décor, the bedrooms and the roaring fireplaces are breath-taking. The Manor’s main attraction is the resident herd of Rothschild Giraffes that roam the grounds, frequently poking their spotted faces in through the windows! Wildlife at the doorstep. The manor prides itself in the giraffe sanctuary right at its doorstep. Its interiors are adorned with paintings and photographs of the valued wildlife. The colour scheme itself does not stray far from the colours of nature, the soft warm colours of the surrounding savannah grassland. The interiors have been conserved as designed in 1932, with oakwood finishes that arise from the neo-classical architecture of that era. The oakwood forms an intriguing contrast with the white paint on the walls. Another characteristic that dates it back to the neo-classical era is the arches on openings. The small five-star hotel is set in 12 acres of private land amongst acres of indigenous forest where a Giraffe Centre was set-up for the endangered species. It began as a breeding centre to boost their population but has now expanded into conservation and educational programs for Kenyan school children, and they include warthogs, hyenas and the odd leopard to maintain the Giraffe’s natural habitat. An amazing project for African wildlife, especially as all the profits of the hotel go towards the African Fund for Endangered Wildlife. The manor houses one of Nairobi’s finest restaurants, a favourite for tourists who might be a tad biased since the fantastic breakfast spread has the bonus of giraffes popping in to say ‘howdy’ through the open windows. They’ll innocently mooch about the property peering through doorways and windows in natural curiosity and friendliness. 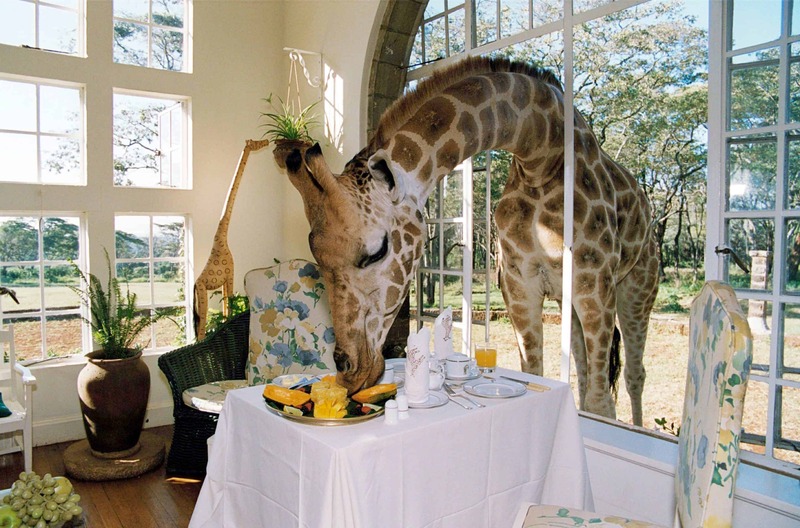 It is the only place in the world where you can feed a giraffe from your second-floor bedroom window, at the lunch table or literally at your front door. In 1983 Rick Anderson, Betty’s son from her first marriage, and his wife Bryony, moved into the Manor, and a year later opened the Manor as a small, privately hosted hotel where guests could feed the giraffes from their breakfast table, through the front door, and out of their bedroom window. The Manor has six bedrooms, one of which is furnished with the belongings of Karen Blixen. In March 2009 the Manor was purchased by Mikey and Tanya Carr-Hartley and now forms part of the Tamimi group of lodges and hotels. The total acreage of the Manor and giraffe sanctuary goes up to 115 acres (47 ha), run by the African Fund for Endangered Wildlife, a charitable organisation set up by Jock Leslie-Melville in 1972. All profits from the hotel go to furthering the charitable objectives of AFEW. Nature is the attraction of Giraffe Manor, plus the exquisite bedrooms to snooze in… but its close proximity to Nairobi, 20 kilometres away, makes it a great place to base yourself to explore the city. Of course the catch is its price, which can be up to $500 per night. If you do have the pleasure and privilege of scoring a stay at the Giraffe Manor, get a second floor room with a balcony. You can’t be grumpy in the morning with a giraffe greeting.